The motorized pressure switch integrated on top is used for easy starting or stopping of the air compressor. For protection reasons, the switch as well has a release pressure valve positioned on the adjacent side of the switch is intended to automatically let go of compressed air from the head pump of the air compressor and its release line when the compressor is shut off or reaches its cut-out pressure. This thereby enables the motor to start over freely. It has a pressure regulator knob which increase or decrease the amount of air pressure coming from the air tank. The Senco PC1010 has a motorized breaker located on the pump. So when there is an excessive amperage draw it will result in breaker tripping so as to protect the motor and operator. The air intake filter is designed in such a way that it purify incoming air into the pump so as to ensure that the pump continually gets a clean supply of air. Its speedy time recovery will allow you to finish your task easily. It has a system relief valve that is designed to prevent system break down by alleviating pressure from the device once the compressed air reaches a predetermined level. The Senco PC1010 is exceptionally low sound and doesn't sound much when running. And this allows you to work on projects without disturbing others in the close vicinity. Its feet are been covered with rubber for the safety of your home floor during usage. An air coupler and plug are factory installed on the air pipe hose to save operator effort and to keep spills from happening from happening. No assembly or coupling is needed and this implies straight usage when purchased. 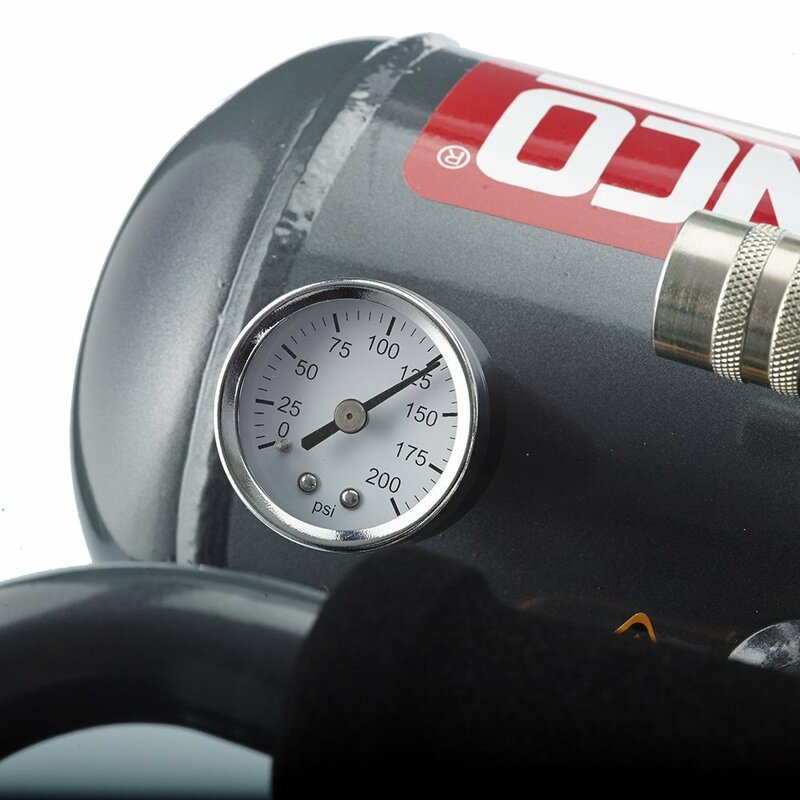 The presence of the outlet pressure gauge indicates the air pressure accessible at the regulator outlet side. This pressure is also controlled by the regulator and is always less or equal to the air tank pressure. It tends to overheat if run too hard. Serious harm could occur from physically contacting uncovered metal components. These parts can stay hot for some while after the air compressor is shutdown. 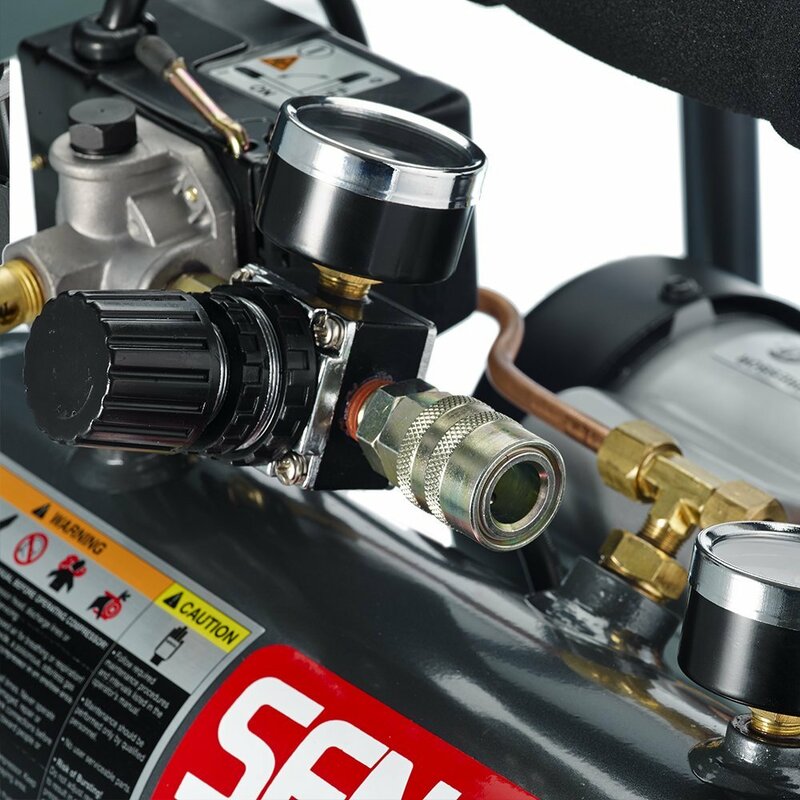 The Senco PC1010 compressor is a portable powerful device that will definitely be of help for a range of renovation and home improvement jobs. This air compressor is best suited for some of the less heavy-duty tasks (for example – inflating tires or balls, painting, cleaning, nailing and so on). It’s lightweight and portable for easy maneuverability. This is a wonderful indoor air compressor which is reflected in a way that it is a standout amongst the quietest. However do not ponder it has a low power due to its quietness because it has a peak of 1 horsepower and up to 125 PSI, it has ample power for jobs been needed to be done at home. The Senco PC1010 comes in a popular “Hotdog” design solution which makes it pretty easy for finishing and trimming work as well as a variety of crafts that provides ample pressure intended for a diverse sort of minor to major tasks that needs the use of pneumatic tools. Take a look at its overall performance and swift time recovery, you will definitely discern it is precise competent as well. Designed to meet all safety standards, Senco PC1010 provides strength and extended life due to its corrosion-resistant aluminum protection. Lightweight and portable compressor — easy to convey from one place to another as work goes on. Perfect for all kind of renovation and home improvement jobs, as well as for hobbies and crafts. Capable of delivering 20 to 44 drives per minute make efficient, mess-free operation. Built with an Oil-Free design that helps in accomplish your tasks without having to lubricate it. 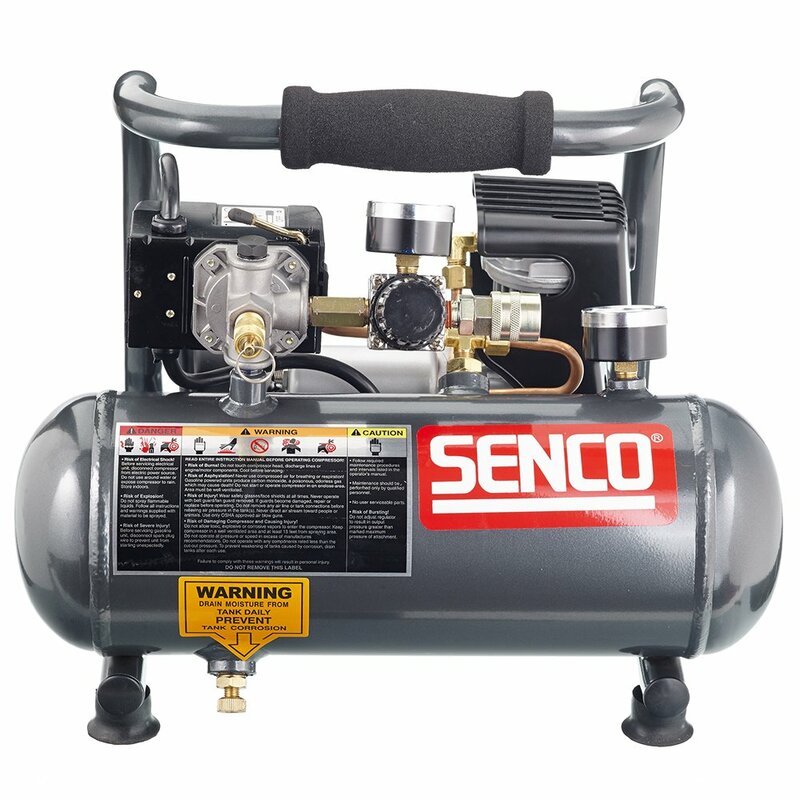 Senco PC1010 1-Horsepower Top 1/2 HP Operating 1-Gallon Compressor is eco-accommodating because of its Super Quite capacity, allowing you to utilize it outside and in the house with no impedance. With only 4 Amps power input, the powerful motor delivers a 120PSI maximum power that is capable of reaching up to 125PSI. It only needs 128 seconds to pump up and 35 seconds to recover, this hinders you from wasting valuable time. The direct drive pump works normally at 5 HP attaining its optimum at 1HP. This high-efficiency air compressor provides a drive of 20 to 44 per minute, based on the air tool begin connected. The cylinder is made of aluminum to for durability. You can use the air compressor for extended period because it has air tank of one gallon. It takes only 35 seconds to recover. Dimensions: 14 by 13 by 10 inches. The Senco PC1010 Compressor is pretty good compressor. It’s light, portable, has a swift retrieval period, is robust, and has various safety features which prevent anything unintended from coming up. It is one of the silent compressors to work with. You will be pleased when working with one.